Whether it's for a competition like Angular Attack, where you're competing team versus team, or in the open market, where your customers vote with the mighty dollar, every app you build will be judged. Standing out from competition and rising above the sea of mundane apps means you need something extra to make your application win over the rest. So what's your plan of attack? Strategy is important here, so let's review some ideas that can help you win and win big! Before we begin, remember using Kendo UI for Angular in your application submission will help you win extra $$$. The free trial version of Kendo UI qualifies, no purchase necessary. Engaging the user in a world full of apps begging for your users attention can be tough. One sure fire way to keep your users from swiping your app into trash heap is to reward them for milestones and track their progress. This strategy works great with fitness apps, social media, and even banking. Setting goals for you user will vary from one type of application to another, but make setting goals and tracking their progress straight forward and easy. Give the user plenty of visual feedback, charts and check points. These are a great way to display the users goals. Using charts and graphs with Angular is easy thanks to Kendo UI for Angular. Kendo UI for Angular Charts are a set of Angular components for building common chart types for many different series types. Simply bind data and add events to make your charts interactive. Empower your users to tackle a complex problem with data. This strategy works great with apps that track clean energy usage, medical research, and finance. Modern applications collect or utilize large data sets and giving users the right tools to access the data can be challenging. However, there are solutions using Kendo UI for Angular that can elevate your app above the rest with the Grid and Data Query components. The Kendo UI for Angular Grid component is a world class data grid with rich features like sorting, templates, grouping and aggregation. Enabling users to visualize data with aggregates for grouped data is a powerful combination of features that makes sense of data at a glance. If you need the raw data crunching power in your application, take advantage of the powerful and efficient Kendo UI Data Query package. Data Query is the heart and soul of the Kendo UI Grid, and you can take full advantage of its sorting, filtering, grouping, and aggregate data operations for your app. Until very recently, artificial Intelligence (AI) was science fiction. Today it's a different story, where AI is woven into every application we touch. This strategy is excellent for apps in the accessibility and security space. Computer Vision apps are capable of image moderation, detecting emotion, optical character recognition (OCR), and even providing picture-based authentication. Prove that your app is next generation by mashing up leading-edge technologies. Combine Computer Vision from Microsoft Cognitive Services and manage image uploads with Kendo UI for Angular's Upload component. The Kendo UI Upload component is the ideal file upload management component for Angular. Don't limit your app by ignoring a world wide audience, instead think globally with localization and internationalization. This strategy is ideal for any app that utilizes Kendo UI for Angular. By using Kendo UI you're already set up for successfully supporting multiple languages/cultures. Translation and internationalization APIs are baked right into Kendo UI, it's there when you need it, right out-of-the-box. 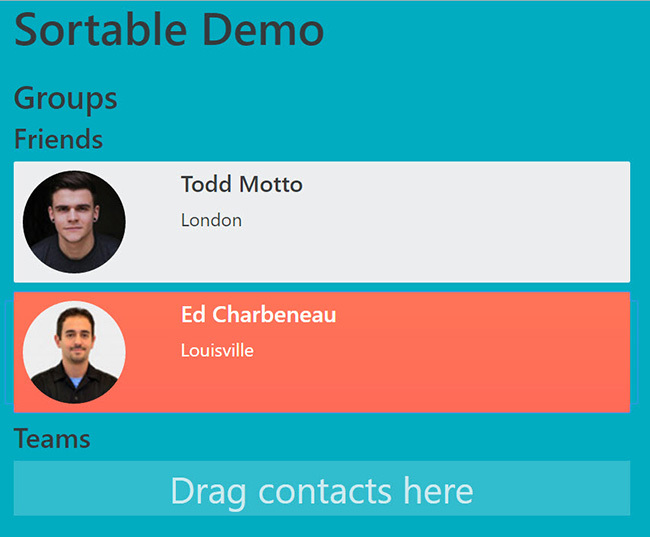 Take a different approach to your UI by adding drag and drop functionality to your components with the Kendo UI Sortable component. This strategy is great for consumer apps that should be intuitive and engaging. The Sortable component makes the elements within a list sortable through the drag-and-drop functionality. Be creative with the Sortable by going beyond the appearance of a list to make unique UI experiences such as: building toppings on a pizza, adding items to a cart, or customizing features on a vehicle. When you combine the Sortable with custom CSS you're only limited by your imagination. Build it once with Angular and deploy to not just the web, but also native iOS and Android as well. This strategy is perfect if your app belongs in the app store, or has a mobile companion app. Also, if the winning app in the Team category includes a NativeScript mobile app, (visible on the web with an Appetize.io free account), we’ll award $5,000! It’s 100% free and open source. You can go through the NativeScript Angular tutorial to get a feel for how it works or watch the video below to see code sharing in action. If your Attack strategy is to make big money by winning Angular Attack, then mixing and matching the strategies above are your best bet. Progress, the company behind Kendo UI for Angular and NativeScript, is offering up extra winnings when you use Kendo UI or NativeScript to win Angular Attack. If the winning app in the Team category includes a NativeScript mobile app, (visible on the web with an Appetize.io free account), we’ll award $5,000! Hopefully you find inspiration in these ideas to plan your ultimate strategy for Angular Attack and beyond.